What are the changes to SD card support in Android 4.4 (KitKat)? With Android 4.4 (KitKat), Google blocked apps from writing to the SD card except for a very specific sandboxed location. This help page will list the changes that we had to make in order to comply with Google's edict. Because all synced files and podcast download are now stored inside the app storage directory, they will be removed when the app is uninstalled. You will have to resync them after reinstallation of the app. Also, because the synced files are inside the Android directory on the SD card, they are hidden from the Android Media Scan process by the .nomedia file that Google creates in the directory. But during an AirSync, our app manually inserts entries into the Android Media Scan database so other apps like Google Play Music can see the synced files. But if the AMS database is cleared, these manual changes are removed so the synced files will not be seen by any apps, including ours. 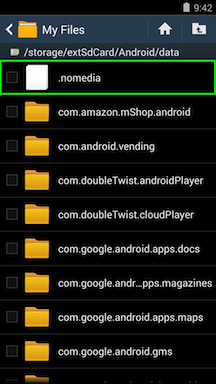 When launched, please use "[PATH_TO_SD_CARD]/Android/data/com.doubleTwist.androidPlayer/" as the directory to scan. 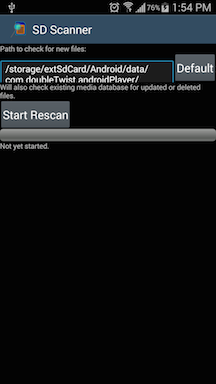 Tap on "Start Rescan" to scan the doubleTwist directory on the SD card. This will again insert entries for the files into the AMS database so that when you reset the doubleTwist library database, all files on the SD card will be restored. While files can be seen by other apps because we manually update the Android Media Scan database, this does not apply to playlists. This means that other apps that use the AMS database like Google Play Music will not able to use any playlists that we sync to the SD card because of the .nomedia file that Google uses in the Android directory. Because apps are blocked from writing to the SD card except for the sandboxed location, you will not be able to use doubleTwist Music Player or any other apps to delete songs and albums on the SD card that are in other common directories like /Music or /MP3. For example, if you manually copy songs to the /Music folder on the SD card, these files will appear in the doubleTwist Music Player app but you will not be able to delete them. If you try to delete these files, our app will behave as if the file has been removed but they are only removed from our library database and not removed from the SD card. Since apps are sandboxed into a very specific directory and not allowed full access to the SD card, songs and pictures that are stored in other directories on the SD card can not be imported back to the computer during a sync. The QA/Dev team is investigating workarounds for this limitation imposed by Google.